Food, drink and honesty stall goodies are available for donations. 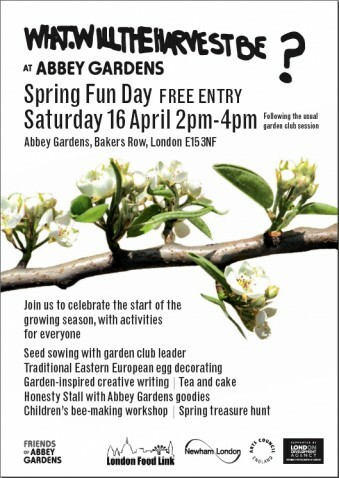 Abbey Gardens is a community garden where anyone may learn to grow organic vegetables, fruit and flowers. There are regular garden club sessions and the garden is open to visitors from dawn till dusk. New gardeners are always welcome. *It's a 'Harvest' Garden - this means that individuals are not allocated their own plots but the whole space is gardened communally with people taking up jobs as and when they need doing. *The space is open access from dawn to dusk - again this makes it very different from a private garden or allotment and underlines that we see it as a public space. *We have a paid Garden Club Leader for three sessions a week, to oversee the basic running of the garden and help with teaching skills to users. *We have two honesty stalls (designed by Andreas Lang) which are really well designed and unique and a great promotion tool - however, they need a good amount of time spent on them regularly to really work well. *The running of the garden takes a good deal of administration - even with the paid GCL in place, which means the friends group spend a lot of time on admin as well as gardening. *Events are popular and seem to be an excellent way of promoting the garden, and bringing in new members. *The take up for the project is very diverse but currently most of the regulars who come are fairly novice gardeners. The design of the site could in fact accommodate both new and very experienced gardeners but it's interesting that so far not many people with a huge amount of existing knowledge have joined up. *The space really seems to work for those who want regular time in a garden but wouldn't (for example) have time to cope with an allotment or a big space of their own. There's a sense of security in the knowledge that if you are away for a couple of weeks that the whole space won't grind to a halt and plants die. *Some of the regular users travel quite far to come to the garden on a regular basis - in fact although the core 'friends' group are very local most other regulars do travel to come to the garden. *At present people tend (to my mind) to under use the produce we grow - so the understanding that anyone can harvest produce who helps in the garden seems to encourage people to be very modest with their consumption. In some ways this is great (and it's very nice when produce can be used for a big dish at community events for example) but personally I would love it if more of the regulars ate more from the garden and it had the effect of changing their food buying habits - all the produce is organic and involves zero food miles, this for me makes it a scandal if we end up throwing any away! *Not everyone enjoys gardening who uses the space regularly - again this might seem counter intuitive but I have found it really interesting to see how some friends have adopted more of the infrastructure or events-based jobs - I have the feeling that they prefer these to gardening and I think it's great that the space can accommodate different enthusiasms. *Related to this there seems to be an understandable desire to keep 'improving' the infrastructure in the garden without sometimes an evaluation of how additional resources might be used/maintained. There's also sometimes a potential problem with communicating the resources we do already have and how much work it takes to keep these going (from the watering system to the webcam & database as well as simple things like turning the compost and harvesting produce). *We have a (to date) amazing plant database - unique in design and an amazing record of what we have grown in the space - however, this seems underused by the actual gardeners and is very time consuming to maintain. *There are sometimes different assumptions about who the garden should be 'for' even within the friends group. *We began the project as a one year experiment - it soon became obvious that this time frame was madness (!) and the test Harvest Garden should run for at least 3 seasons - however, it was not designed as a permanent space and so it's important that all the stake holders do reassess the space at the end of the 3 years trial period. As a postscript to these thoughts at the start of this season the friends group had a group 'review' of the project and our collective thoughts - what we like, would change and thoughts on the future of the garden. We're still in the process of turning these into a list of outcomes but it was a fascinating privilege for me to take part in this. I am normally very sceptical about project 'evaluations' for engaged practice, as they are often just a box ticking exercise for releasing final funds. This was a completely different thing, a real exchange of ideas from many people some who have been with the project before Karen & I came on board and some who were totally new to the garden and have none of the 'baggage' of setting it up. I found the whole experience rather uplifting in the end, despite being quite nervous at the start. The 'likes' ranged from (many comments that reflected those above), to cut flowers & a 'surrogate pub'. 'Things to change' went from 'more meetings' to 'less admin'! 'My' mecanopsis - a personal favourite plant and database entry! It's with much pleasure after a number of late nights I can declare the 2011 season 'Now Growing' section open! This is becoming my annual equivalent of switching on the Christmas lights (or as Andreas pointed out doing my taxes!) once a year I input all the 'out' dates for plants in the database that are no longer in the beds and then after a bit of behind the CMS secret curtain magic Dorian does something I imagine like cutting a ribbon or hitting a huge red switch and hey presto we have a new set of 'clean' beds and only the perrenial plants appear for a few short weeks before we start sowing and planting them all again! Filling out the plant database can (frankly) at times be a real bore BUT with two years worth of data now logged in I can really start to see the value of this as a permanent record of what the Friends of Abbey Gardens group have achieved as well as an informative resource for other community gardening groups. As more and more plants go in you can compare varieties, add recipes and generally start to feel the benefit of all Hamish, Chris and I's diligent recording and photo-taking. I know it's a tiny bit sad but I also really like to have a record of the plants I personally have lovingly grown. 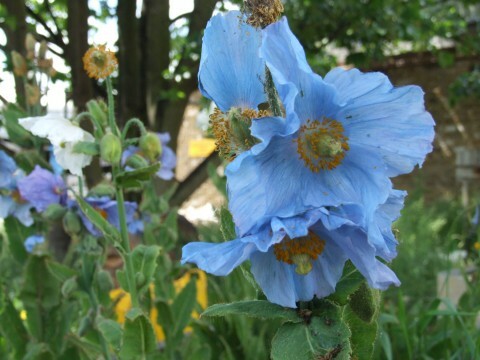 The blue poppies are a real favourite - the seeds came from plants in Karen's garden (which she in turn no doubt grew from seed!) and I then grew the first plants we had at the garden. Today (three years on) I gave my Gran some new plants grown from the next generation of gathered seeds, the rest will be for sale at this weekends Spring Event. 2011 is currently a fresh slate - for a few weeks only - enjoy.